"Millennial" "Youth Employment" "Retain" "Millennial Culture"
By 2020, Millennials (born between around 1980 and 1994) will make up around 35% of the workforce, they are already the largest people group and are beginning to shape and change the way organisations do their business, from the technology they use, to the way they communicate. This generation has been much criticized as the lazy and self-entitled ‘ME’ generation, but are proving many people wrong with their work ethic and their drive to become successful. Millennials are bringing a lot to the workplace, they are tech-savvy, innovative, educated and diverse, creating fresh new ideas and experiences, this, after all, is the age of the startup and entrepreneurs. They are also ambitious and place huge emphasis on development and personal growth with a massive 91% wanting rapid career progression, added responsibilities, and leadership; this new generation clearly wants to make an impact and could be key to your organisation’s future success. These ambitions, however, come with expectations; millennial talent wants more than just a paycheck, they want to work for a place with a purpose and a place where they can develop and grow. Millennials are also expecting more flexibility, with an increasing demand on work-life balance and downtime from work. Millennials want to work hard but only for the right place. Is your organisation meeting millennial expectations? Millennials are demanding more from their employers, but, if an organisation fails to fulfil a millennial’s expectations, then there will be no hesitation in them looking for an opportunity elsewhere. Unlike previous generations, millennials are not expecting to stay at a job their entire life, they want to ensure they are progressing in their career faster, and will not hesitate to look elsewhere if they feel that their career is stagnating. In fact, 43% of millennials envision that they will leave their jobs in the next two years in order to better progress and develop their careers or gain better financial rewards/benefits or flexibility. For employers, this increase in job hopping has seen a rise in employee turnover which is having a negative impact on the bottom line for organisations up and down the country, especially when it costs around 20% of an employee’s salary to find a replacement. Imagine, you have just hired a talented young millennial who excelled in the interview stage because of their eagerness and excitement to work for an organisation like yours. They start off showing lots of potential and pick things up pretty quickly, but you notice after a while that your new employee has started to drop off and has become disengaged and demotivated, next thing you know they have left and found an opportunity elsewhere leaving you with the prospect of having to recruit and re-train a replacement. It's frustrating, but could you have done more to keep your employee satisfied? You obviously attracted the employee with fantastic reasons to work for your company, but are you living up to these expectations once the employee walks through the door for the first time? For an organisation to retain millennial talent, it has to make sure they are living up to their expectations. Millennial employees are likely to be attracted to your organisation by promises of a positive and fun working environment that nurtures their desire to grow and succeed, but are you making good on these promises? Here are three areas of your business where you can make good on these promises. A millennial wants to work hard, but only for an organisation that matches their values; if an organisation fails to match these, they are going to get frustrated pretty quickly. It is important to understand what your employees want, millennials value social responsibility, equality and diversity, and benefits such as flexible working and holidays; if you can demonstrate what your millennial employees want then you will have a higher chance of keeping your younger talent happy. Companies have to adapt to meet the expectations of their millennial workers, for example, with the rapid rise of smartphones, social media, and the internet taking place in their lifetime, millennials are the first generation to be digitally native and, as a result, technology is becoming increasingly essential to attracting and retaining millennial talent. With 53% of millennials saying that they are more likely to take a job with an employer who uses the same technology as they do; use substandard technology and your company will likely be a turn-off for millennials who rely on modern tech to do their job properly. Millennials also want a social work environment, they want to get to know their co-workers better so they can form stronger working bonds; it is, therefore, important to arrange social events such as charity fundraisers so people can better connect with their colleagues. By meeting these values, not only will you be able to retain millennial employees, but you will be able to build a stronger employer brand that can be used to attract more skilled young talent in the future. As mentioned earlier, millennials want rapid career progression, they don’t just want to learn their current role, they want to be prepared for the next step on the ladder, as well. During the recruitment process, you probably outlined what the job role was, but it is also important to outline the potential opportunities and career progression to millennials looking at climbing the ladder at your company. By communicating your progression path, opportunities, and responsibilities from day one, you can ensure that you are giving your millennial employees a vision with your company in where they can progress and succeed. Millennials need to continuously grow and develop, and are committed to personal learning, and development, to achieve this. To help, companies can prepare a digital training programme specific to each department or role, so millennial employees can view training materials relevant to them whenever they require. Your organisation can help develop mentorship programmes, where new millennial talent can learn from senior colleagues in the company. Not only will your millennial employees learn new skills that can help prepare them for more senior roles in the future, but your senior colleagues will also get a new perspective and new ideas from fresh new talent. With millennials demanding regular feedback from their manager, it is also important to ensure that you are offering frequent constructive advice on how your millennial employees are performing. As an employer, it is important to set clear expectations and goals so an employee can know what they are going to be evaluated on. With an engagement app, you can communicate these expectations and offer feedback on what they need to do to meet these expectations. Additionally, if an employee is performing well, you can communicate with them to show recognition for their hard work, giving them the fulfilment that they need to be satisfied in the workplace. 71% of millennials are reportedly disengaged at work; that is a lot of talented employees that are dreading coming in to work every day. Not only are these employees less enthusiastic and not as productive as they could be, but they are more likely to jump ship if another opportunity arises. For a lot of millennials, disengagement comes about from not having enough purpose or meaning from their work. If there is no reason to work for a company, then there will be no desire to stay. Millennials need to feel that they are working and contributing to a worthwhile cause, it is what drives them and pushes them on to succeed. If a millennial employee is working towards a shared goal, they will be more enthusiastic about coming into work and staying at your organisation. It is therefore essential that you are transparent with millennial employees; these workers need to know what’s going on so they have a clear idea of what they are working towards. By keeping lines of communication open with an engagement app you can keep employees up to date and set out a clear vision that gives a millennial employee a sense of purpose. Millennials also want to have their opinions heard; if they are going to work for your company, they need to have an environment that accommodates their ideas. By listening to their ideas and feedback through apps like Officevibe, you can gain an understanding of what is needed to keep your employees happy. Officevibe helps you to identify specific issues in your workplace that need to be improved or enhanced, allowing you to nurture your company culture to help create a positive and attractive workplace that a millennial would want to work. 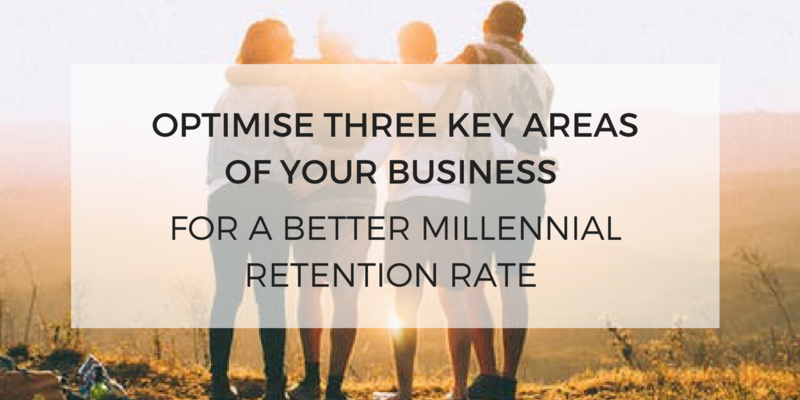 By offering frequent engagement, encouragement, and development opportunities, not only will you be able to attract and retain your millennial talent, but you will be molding successful employees who will help your organisation be productive for many years to come.